The deadly white supremacist rally in Charlottesville nearly one year ago shocked the country. “I could see from my office here in New York City how this was building,” Mike German says in an interview with correspondent A.C. Thompson for the new FRONTLINE and ProPublica investigation, Documenting Hate: Charlottesville. 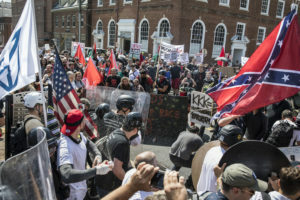 German tracked the Charlottesville violence closely as it unfolded in his current position as a fellow at The Brennan Center for Justice at New York University Law School. In the above excerpt from the documentary, German points to a series of violent clashes in California over the past two years involving far-right groups and counter-protesters — some of the same far-right groups, Thompson reports in the documentary, that would descend on Charlottesville on August 11 and 12, 2017. As FRONTLINE and ProPublica note in the documentary, the FBI had issued warnings about white supremacist violence before Charlottesville — but it’s unclear what came of them. No one currently inside the bureau would sit down with Thompson, but in a statement, the FBI said that while it doesn’t police ideology, it has long investigated white supremacist extremists, and will enforce the rule of law. Thompson asked German about the impact of so few arrests at confrontations in the runup to, and at, Charlottesville. “And your sort of sense is, if you allow folks to go out and act very violently over and over and over again in these political spaces, then they basically start to think, ‘Hey, the cops are OK with us’?” Thompson asks. For more on law enforcement’s response to America’s new white supremacist groups, watch Documenting Hate: Charlottesville. 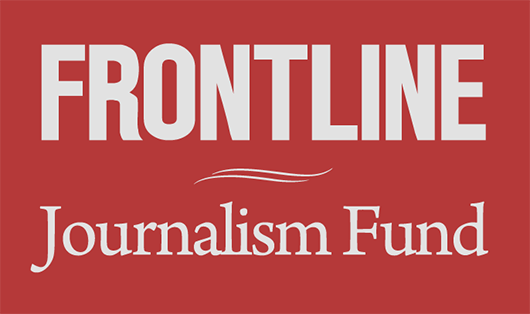 For the past year, FRONTLINE and ProPublica have been investigating the white supremacists and neo-Nazis involved in the Charlottesville rally at which 32-year-old counter-protester Heather Heyer was killed. This joint reporting has already revealed that one participant in the weekend’s violence, Vasillios Pistolis, was an active-duty Marine (he has since been officially separated from the Marine Corps), and that another, Michael Miselis, worked for a major defense contractor and held a U.S. government security clearance. Now, in the Documenting Hate: Charlottesville film, Thompson goes even deeper —investigating why, nearly a year after the rally, many of the perpetrators of racist violence have not been held accountable; tracing the origins and actions of the white supremacist groups they belong to (and how they operate and recruit); revealing just how ill-prepared law enforcement was to handle an influx of white supremacists from across the country; and exploring how, according to experts, white supremacists have moved out of the shadows to gain a foothold in mainstream culture. Documenting Hate: Charlottesville premieres Tuesday, August 7, 2018 on PBS stations (check local listings) and online at pbs.org/frontline.